Day 5 - Excursion to Seoul. Today we left about 9:30 a.m. local time, caught a bus, rode a subway and made it to Seoul. We started out by heading to lunch. This was an interesting experience because none of our Korean buddies were sitting at our table so we were figuring out the cooking on our own. Haha! It was fun though. The meal consisted of seafood, vegetables and thinly sliced beef. The beef we stuck in the pot for like 30 seconds before pulling out to eat. Then, we had noodles. That's when things got interesting as we had to cook the noodles. Well, they were thick and we were starting to run out of broth, so the other half of the table started burning their noodles and Jini came over to tell them to turn off the heat. Then she glanced at our half of the table and told us to turn our off too before it started to burn. The food was very good. It had clams, sea cucumber, bean sprouts, shrimp, octopus, etc. It was all really good! I was quite excited about it. It was also interesting trying to get more water at our table as we are not used to snapping over waiters like they do here. I mean our waitresses would probably get annoyed with us very quickly. Then we had to say "Mul Juiceyo." Again, I probably killed that spelling, but that is the pronunciation. That means, "Please give me water." After lunch we split into groups, my group consisted of Jessica, Ashlin, Paizley, and Josh. We had James, June and Jini with us. That was awesome. They took us around the Myeong-dong district, which was were the restaurant was, and it was like being in a normal shopping district. So they took us to some of their favorite stops and I saw a speaker for my iPod that was shaped like a dog! It was so cool!! That's were I bought a couple of headbands and a decorative chopstick for my hair. I was happy about it. 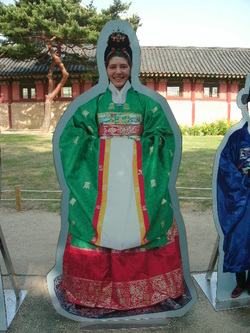 Then we went to the Gyeongbokgung Palace. That was awesome! It was HUGE!!! We walked it and I went walking as we only had an hour. Sadly, none of us saw the maps just past the entrance. That would have made things easier. I want to go back now. It was so cool! I was just blown away by everything I got to see so I will explain that further in the pictures. I bought some postcards and a bunch of bookmarks at the gift shop..
After the awesomeness of the palace, we went to the Insa-dong district. That is like tourist central at great prices. I went nuts here. I bought two fans, a set of chopsticks, a pair of chopstick/spoon sets and a jewelry box. I would have kept shopping but we had to go to dinner. Dinner was amazing! I was so happy about dinner! Ashlin and I decided to share our meals so we ordered pork cutlet, teriyaki chicken and a side of pork and vegetable dumplings. The dumplings were something I had researched for my asian food paper and the pork cutlet reminded us of the south. It was fried, it was stuffed with cheese and "oh my cheese", we were in heaven! Then we did a little more shopping and got in the taxi to head back to Incheon.